The bigger they come, the harder we fight! 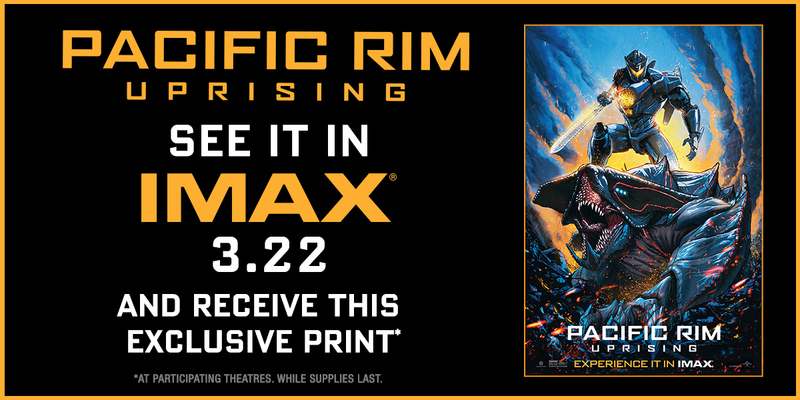 Experience Pacific Rim Uprising in IMAX on opening day (3/22) and return with giveaways. 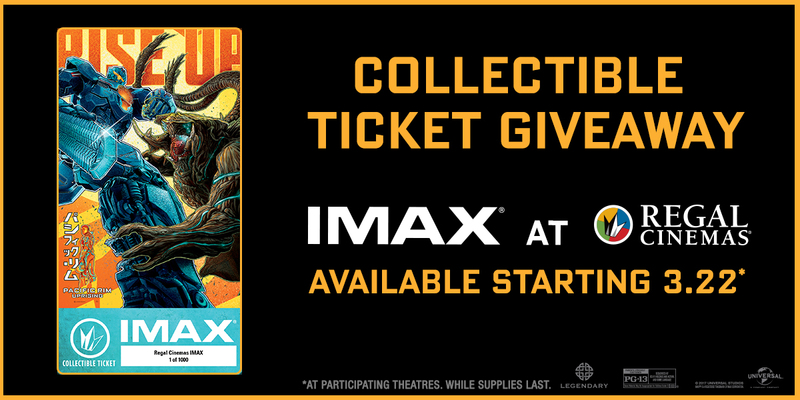 Fans who experience Pacific Rim Uprising in IMAX at Regal Cinemas starting 3/22 will receive this exclusive collectible ticket, while supplies last! Experience Pacific Rim Uprising in select IMAX theatres on opening night 3/22 and you’ll receive this exclusive print. Giveaways are available while supplies last and only at participating theatres. Amstar Cinemas, Brenden Theatres, Celebration Cinema, Cinemagic, Cinema West Veranda LUXE Cinema, Cinemark Theatres, Cineplex, Cinémas Guzzo, Cinépolis Luxury Cinemas, CMX Cinemas, Cobb Theatres, Frank Theatres, Galaxy Theatres, Goodrich Quality Theatres, Grand Theatre, Harkins Theatres, Landmark Cinemas Canada, Malco Theatres, Marcus Theatres, Megaplex Theatres, NCG Cinema, , Penn Cinema, Premiere Cinema, RC Theatres, Reading Cinemas, Royal Cinemas, Santikos Entertainment, Showcase Cinemas, Showplace Cinemas, Southeast Cinemas, The Grand Theatres, New Vision Theatres, TCL Chinese Theatre, IMAX Theatre at The Minnesota Zoo, Esquire IMAX Theatre, IMAX Theatre at Tropicana, Udvar-Hazy Center IMAX Theatre, AutoNation IMAX Theatre, IMAX Theatre At Marbles, Pacific Science Center IMAX Theatre, Challenger Learning Center IMAX, Branson IMAX Entertainment Complex, IMAX Theatre at Indiana State Museum, World Golf Hall of Fame IMAX Theatre, Natick Sunbrella IMAX Theater and Reading Sunbrella IMAX Theater.